(CNN) - Don't look now, but a(nother) skinny kid with a funny name is turning heads in the presidential race. In 2008, it was Barack Obama. In 2020, it's Pete Buttigieg. 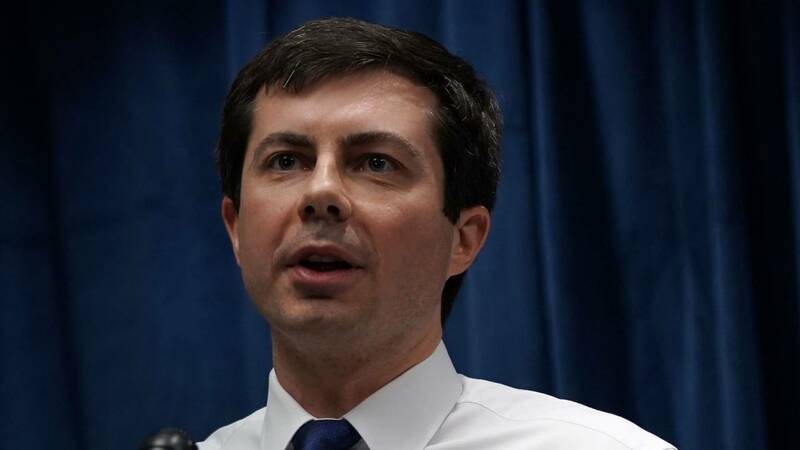 Buttigieg, the 37-year-old, married gay mayor of South Bend, Indiana, is, at the moment, the hottest candidate in the Democratic presidential field -- drawing rave reviews everywhere he goes. "Mika and I have been overwhelmed by the reaction @PeteButtigieg got after being on the show," tweeted "Morning Joe" co-host Joe Scarborough following "Mayor Pete's" appearance on the program earlier this week. "The only other time in twelve years that we heard from as many people about a guest was after @BarackObama appeared on Morning Joe." That's obviously a tough comparison for Buttigieg -- or any Democratic politician -- to live up to. After all, no matter what you think of Obama's eight years as president, it's impossible to deny his massive natural abilities as a candidate. And there are lots and lots of differences between the two men: one black, one white, one a top-tier candidate from day he announced, the other (still) a long-shot, etc. But Scarborough is far from the only person raving about Buttigieg. 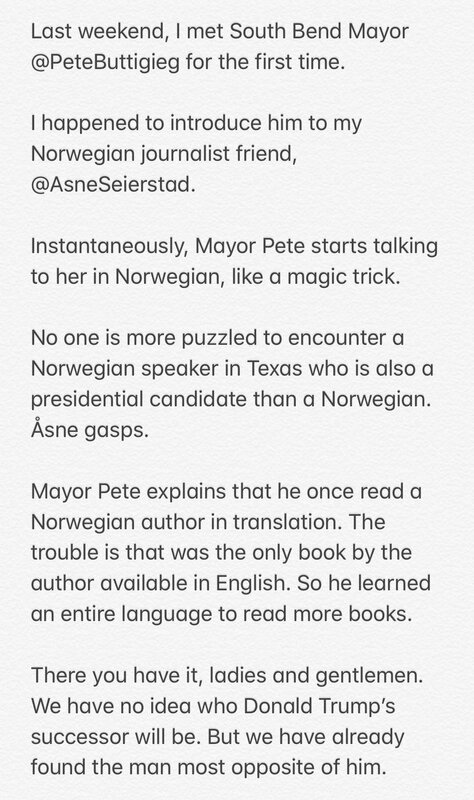 Beginning with a star turn at a CNN-sponsored town hall at South by Southwest in Austin, Texas, earlier this month, praise for Mayor Pete has been bubbling up from every corner of the party. And all of that positive attention seems to be feeding on itself and producing tangible results for his campaign. Buttigieg announced last week that he has already crossed the 65,000-donor threshold that qualifies him for the upcoming Democratic presidential debates. A story about him speaking conversational Norwegian went viral. He'll be on "The View" -- for a second time! -- on Friday. The reasons for the attention he's drawing and excitement he's creating aren't hard to figure out; He's young, charismatic and personable. He knows how to talk like a regular person -- an underrated trait in a field filled with front-running senators. And he has a remarkable resume: Rhodes scholar, military veteran, gay mayor of his hometown. Then there's this: Buttigieg has ZERO expectations about how he will do in this race. When he started running, virtually no one outside of South Bend had even heard of him. When your candidacy isn't weighed down by heavy expectations, you can play fast and loose. You don't obsess over every little thing you say or do. Your every word isn't parsed by the national news media. You can make a mistake (or two) without it being painted as a death blow for your candidacy. And, this: People l-o-v-e a good underdog story. Sure, they might be drawn to the bigger names like Joe Biden and Beto O'Rourke, but Americans will never, ever not be drawn to a scrappy candidate who is charging at the big boys and demanding that he be included in their club. The spunky outsider is in our DNA. And Buttigieg fits that profile to a T.
Now. It's March 21, 2019. No one will cast a vote in the primary process for 11-ish months. In that time, Buttigieg's star could burn out. It could wax and wane. (Yes, I am confusing star and moon metaphors -- but you get the idea.) In six months, we might look back and think he had his moment too soon. But Buttigieg is unquestionably having a moment right now. That's something that many people in this field will never have. Or if they do have a moment, it's for the wrong reasons. (Looking at you, John Hickenlooper.) Winning presidential campaigns are those that create -- or benefit from -- positive moments and turn them into something more, a sustainable bid for the highest office in the country. It's not at all clear whether Buttigieg and his team can make that leap. But it is clear that he has a chance, right now, to do so.